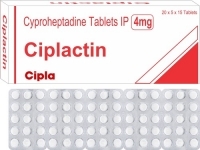 Ciplactin Tablets (Generic Periactin) are used for the treatment of Perennial and seasonal allergic rhinitis, Vasomotor rhinitis, Allergic conjunctivitis due to inhalant allergens and foods, Mild, uncomplicated allergic skin manifestations of urticaria and angio-oedema, Amelioration of allergic reactions to blood or plasma, Cold urticaria and Dermatographism. This medicine is also used to stimulate the appetite and may lead to weight gain, which is helpful for underweight people. Cyproheptadine tablets are also used clinically as an appetite stimulant for children with failure to thrive (Weight below normal) without underlying organic disease. Ciplactin tablets are manufactured by Cipla Ltd. in the strengths of 4 mg.
We supply original Ciplactin tablets manufactured by Cipla Ltd.. The active ingredient present in Ciplactin tablets is Cyproheptadine Hydrochloride . 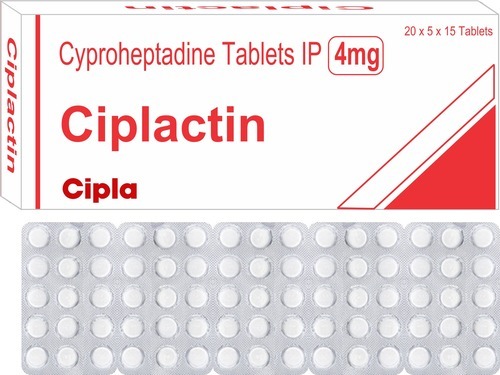 Each Ciplactin tablet contains 4 mg of Cyproheptadine Hydrochloride. The total daily dose for adult patients should not exceed 0.5 mg/kg/day. The recommended starting dosage for adult patients is 4 mg (one tablet) three times a day. The dose should be adjusted according to the size and response of the patient. The normal starting dose is 4 mg (one tablet) two or three times a day. The dosage has to be adjusted as necessary to the size and response of the patient. The maximum dose for children aged 7 to 14 years is 16 mg a day. The recommended dosage is 2 mg orally every 6 hours. Hypersensitivity to Cyproheptadine HCl and other medicines having a similar chemical structure. Due to the higher risk of antihistamines for infants generally and for newborns and premature babies in particular, antihistamine therapy is contraindicated in lactating mothers. This medicine should not be used in newborn or premature infants. Overdosage of antihistamines including Cyproheptadine HCl tablets, particularly in case of infants and young children, can produce hallucinations, central nervous system depression, convulsions, respiratory and cardiac arrest, and death. Antihistamines can cause mental alertness to be diminished. Conversely, specially, in young children, they may occasionally produce excitation. Antihistamines can have additive effects with alcohol as well as other CNS depressants, e.g., hypnotics, sedatives, tranquilizers, antianxiety agents. Patients must be warned about engaging in activities that require a high level of mental alertness and motor coordination, such as driving a car or operating machinery. Central Nervous System: Sedation and sleepiness (often transient), dizziness, disturbed coordination, confusion, restlessness, excitation, nervousness, tremor, irritability, insomnia, paraesthesias, neuritis, convulsions, euphoria, hallucinations, hysteria, faintness. Integumentary: Allergic manifestation of rash and oedema, excessive perspiration, urticaria, photosensitivity. Special Senses: Acute labyrinthitis, blurred vision, diplopia, vertigo, tinnitus. Cardiovascular: Hypotension, palpitation, tachycardia, extrasystoles, anaphylactic shock. Hematologic: Haemolytic anaemia, leucopenia, agranulocytosis, thrombocytopenia. Digestive System: Cholestasis, hepatic failure, hepatitis, hepatic function abnormality, dryness of mouth, epigastric distress, anorexia, nausea, vomiting, diarrhoea, constipation, jaundice. Respiratory: Dryness of nose and throat, thickening of bronchial secretions, tightness of chest and wheezing, nasal stuffiness. Miscellaneous: Fatigue, chills, headache, increased appetite/weight gain. Cyproheptadine HCl has been classified by the US FDA as Pregnancy Category B. Reproduction studies performed in animals with oral or subcutaneous doses up to 32 times the maximum recommended human oral dose and have revealed no evidence of impaired fertility or harm to the foetus due to Cyproheptadine HCl. Two studies conducted in pregnant women, however, have not proved that Cyproheptadine HCl increases the risk of abnormalities when administered during the first, second and third trimesters of pregnancy. No teratogenic effects were observed in any of the newborns. Nevertheless, because the studies conducted in humans cannot rule out the possibility of any harm, Cyproheptadine HCl should be used during pregnancy only if clearly needed. It is not known whether Cyproheptadine HCl is excreted in human milk. Since many medicines are excreted in human milk, and because of the potential for serious adverse reactions in lactating infants from Cyproheptadine HCl, a decision should be made whether to stop breast-feeding or to stop using Ciplactin Tablets (Generic Periactin), taking into account the importance of the medicine to the mother. You can buy Generic Periactin (Cyproheptadine HCl weight gain tablets) online from Clear Sky Pharmacy at a cheap price. Ciplactin 4 mg pills, manufactured by Cipla Ltd., India are supplied in a blister strip of 10 tablets. The 4 mg tablets cost only $0.16 per unit when you place an order for 750 tablets.